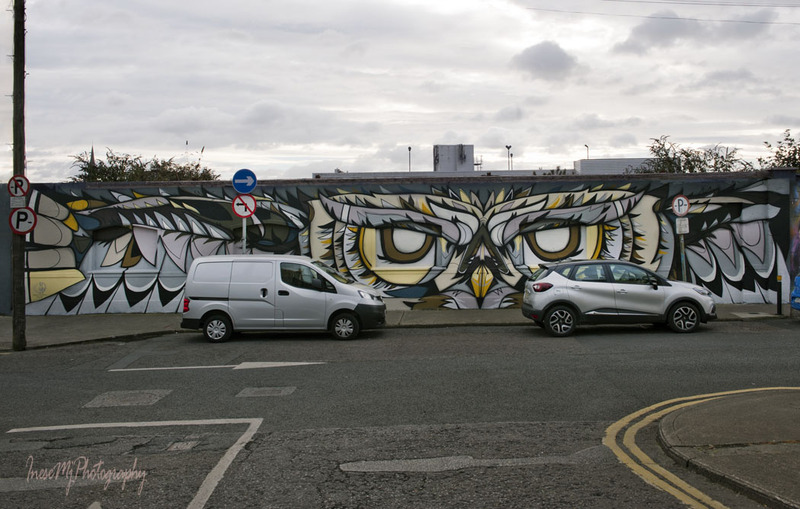 Once again the streets of Waterford became an art gallery as the Waterford Walls festival brought in another 48 works that transformed the look of the city. I had a few days to catch a glimpse of some artists, and enjoyed the completed work when I returned from my trip. 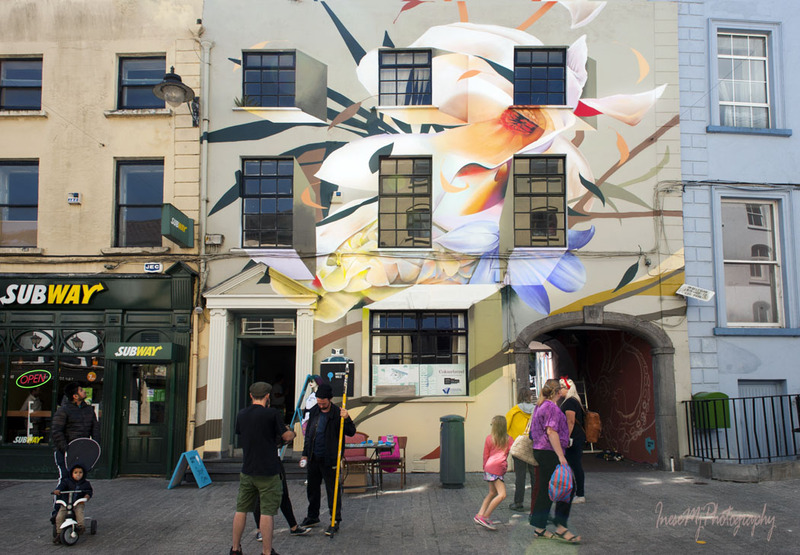 Youri Cansell, aka Mantra (France), is famous for his nature-themed works, but for this festival he painted an image of street artist. What a thoughtful gift! I hope it has a long life – it is already loved here. You see a gentleman in my picture enjoy mimicking the painted artist. 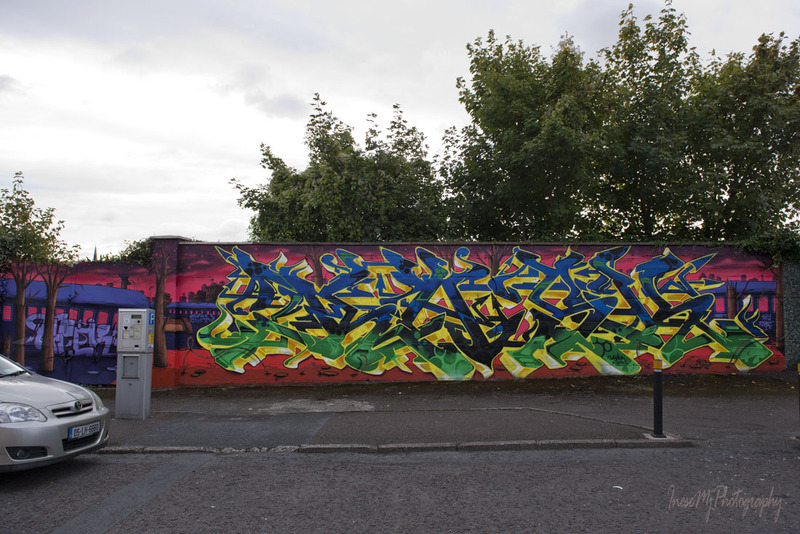 The work is sponsored by Ambassador of France in Ireland. 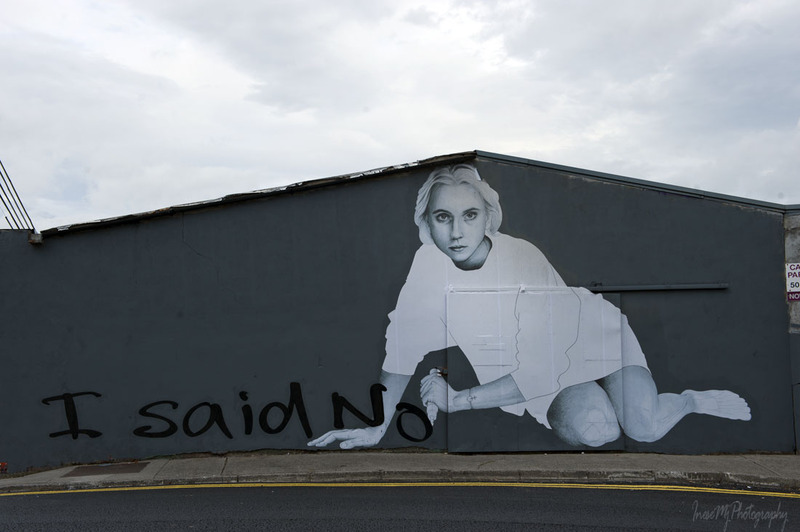 Here are some links to my previous Waterford Walls posts : 2015, 2016, 2017. Ah, and some more 🙂 Now I will take you around our ‘art gallery’. 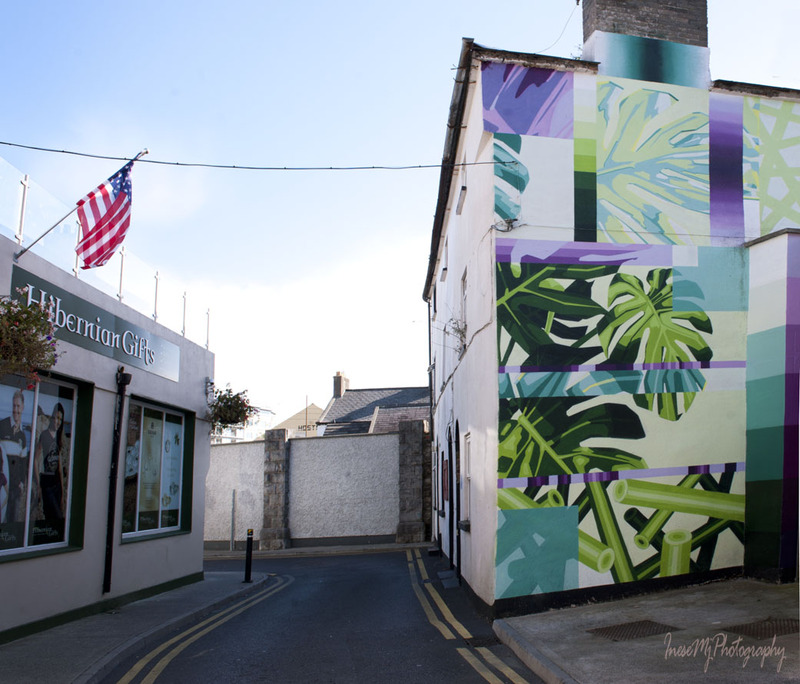 Kevin Bohan is a full time artist and illustrator based in Dublin ( Kevin Bohan Arts). If you open my 2017 link, there is a picture of his mural, The Love Hearts. This time, Kevin is painting a Rainbow Serpent, freehand. He says the wall will guide him. Kevin advises me to come again Sunday and have my hand painted as part of the mural. He explains that the mural is a collaboration project that will include the artworks of two national school students. I show up Sunday ( wouldn’t miss the chance) and lovely Sarah assists me with the hand painting. The mural is sponsored by the Australian Embassy in Dublin ( Kevin used the aboriginal painting techniques in this work). 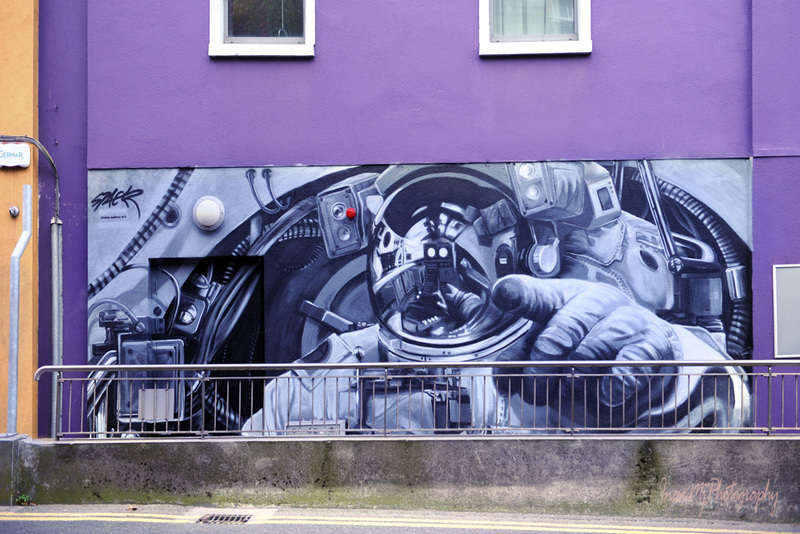 Several mural artists share Stephen street, it is why I like to come here. Toronto/Dubai based artist Fathima Mohiuddin, aka Fats Patrol, is working next to Kevin. 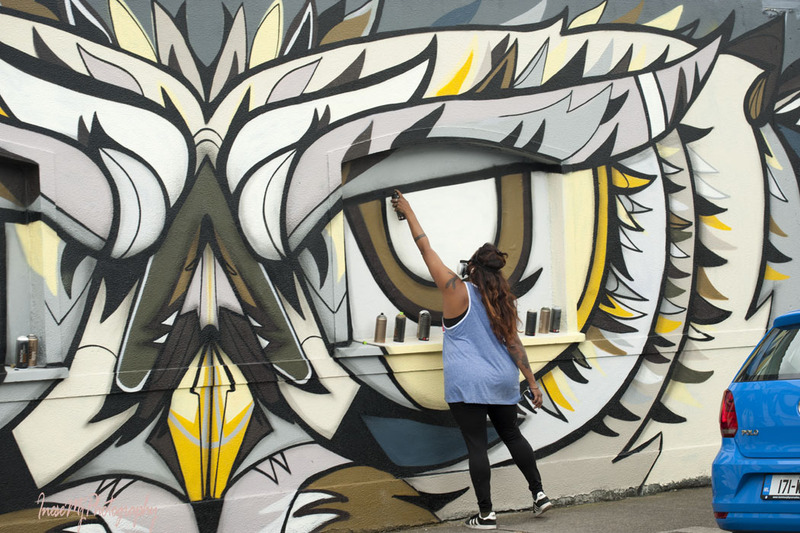 Fats is painting this bold and fearless owl for a reason. It represents female energy and connection between the nature and human spirit. Fats is currently pursuing a diploma in Art Therapy in Toronto. RASK (Ireland) and Bo Pedersen (Denmark) teamwork. 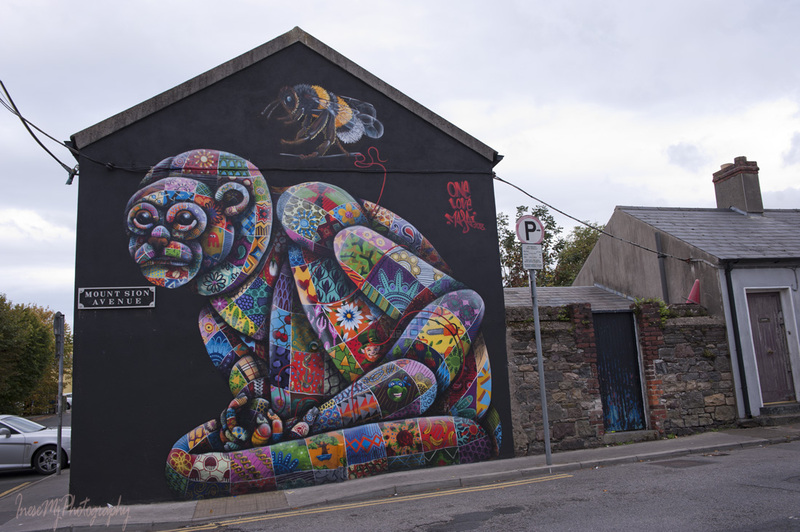 Louis Masai is a painter, sculptor, illustrator and street artist based in London. 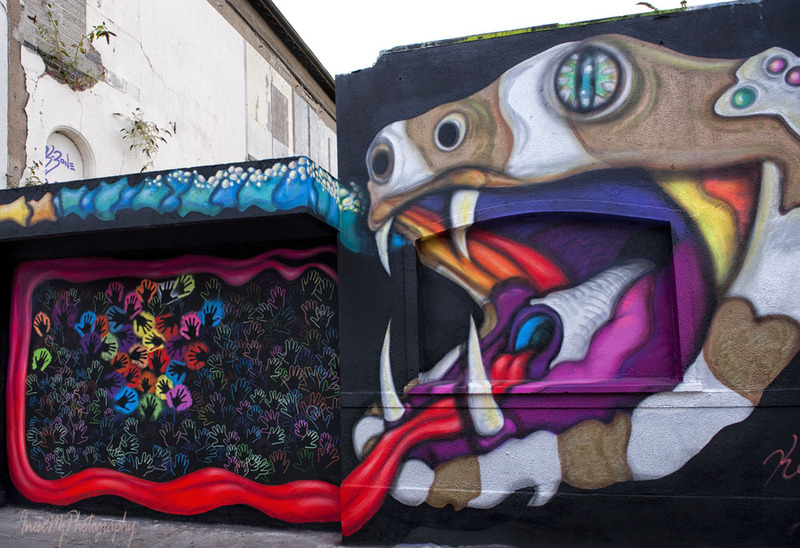 He is best known for his vivid murals of patchwork animals. Graciela Goncalves Da Silva, aka Animalitoland, Argentina. 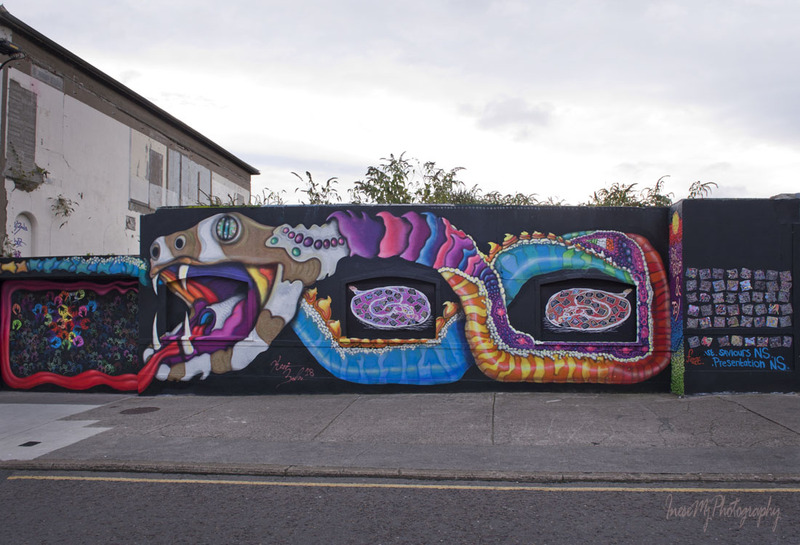 She is a self taught illustrator and graphic designer, second time painting at the Waterford Walls. Garreth Joyce, Graphic artist based in Dublin. 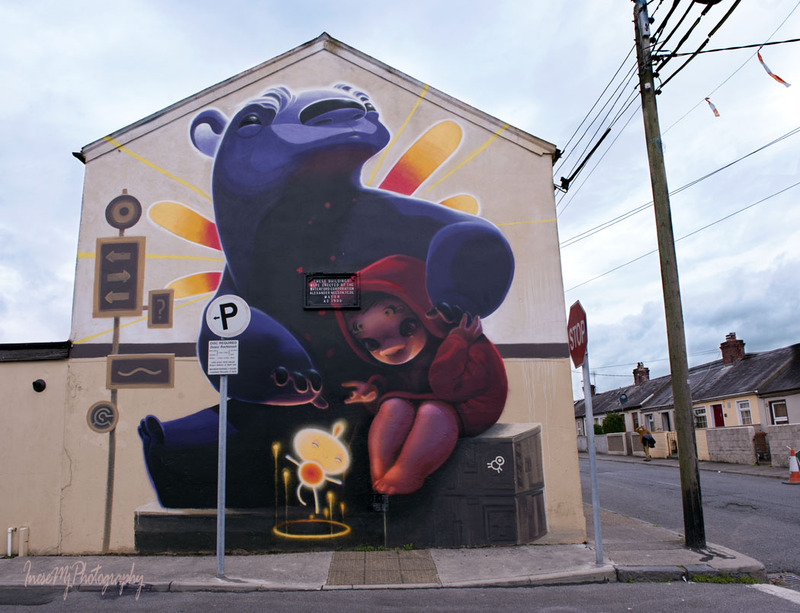 Louis Boirdon and Edouard Egea, aka MonkeyBird (France), a street team sharing their self-created mythology (the monkey stands for realism, the bird for dreams). 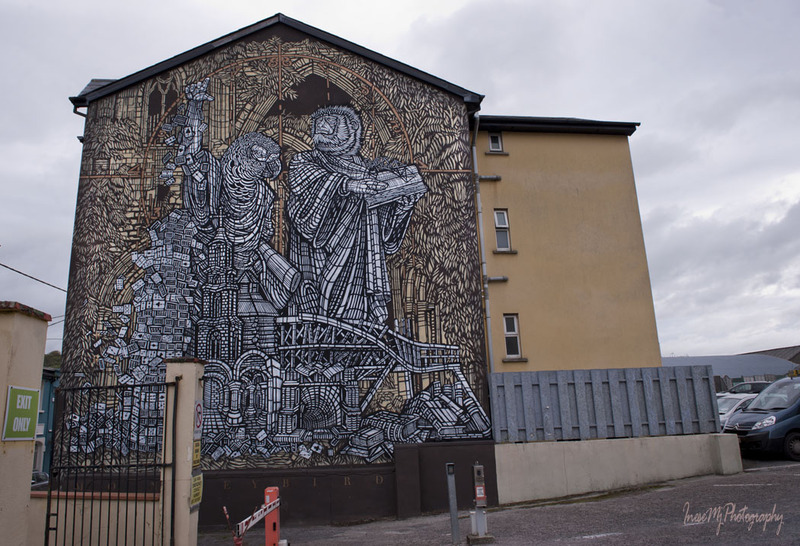 The Castle on the Cliff – a fascinating stencil creation is the duo’s gift to Waterford. Wandering around the town I came across that guy who was painting over a still presentable mural, the work of the Mexican artist KINMX. He said the wall had been allocated for a new Joe Caslin’s work. I wondered if we were suddenly short of the old walls, but fair enough, the murals don’t live forever, and a quality work of a renowned artist is always a bonus. However, I started to worry about the Birdo’s work in the same location. And I was right to worry. Birdo’s work is no more. No comments. 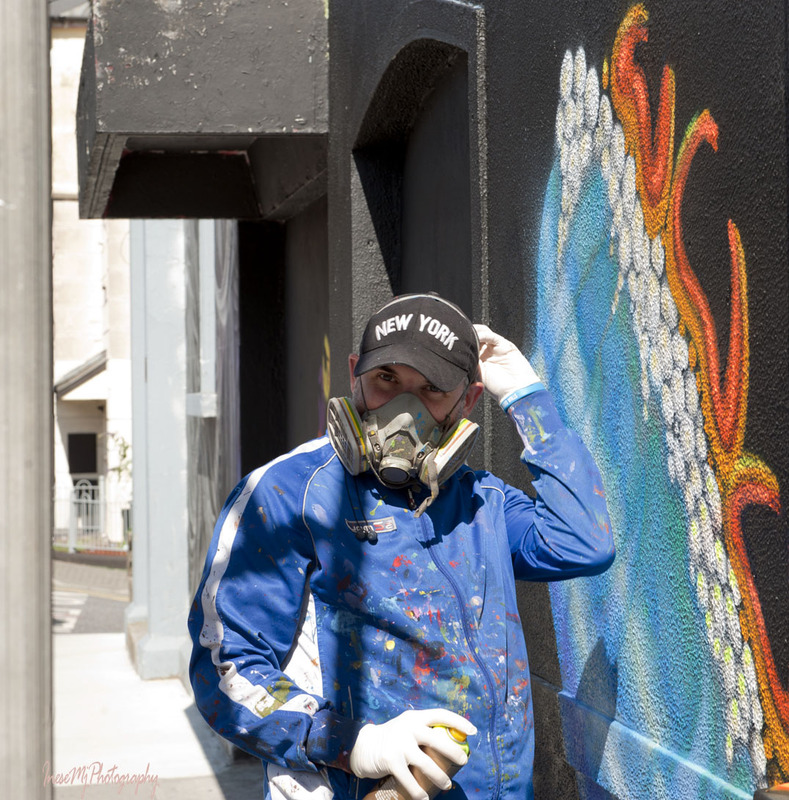 Joe Caslin is using his murals for social change. I don’t know if you are familiar with his nearly identical mural I couldn’t say No. 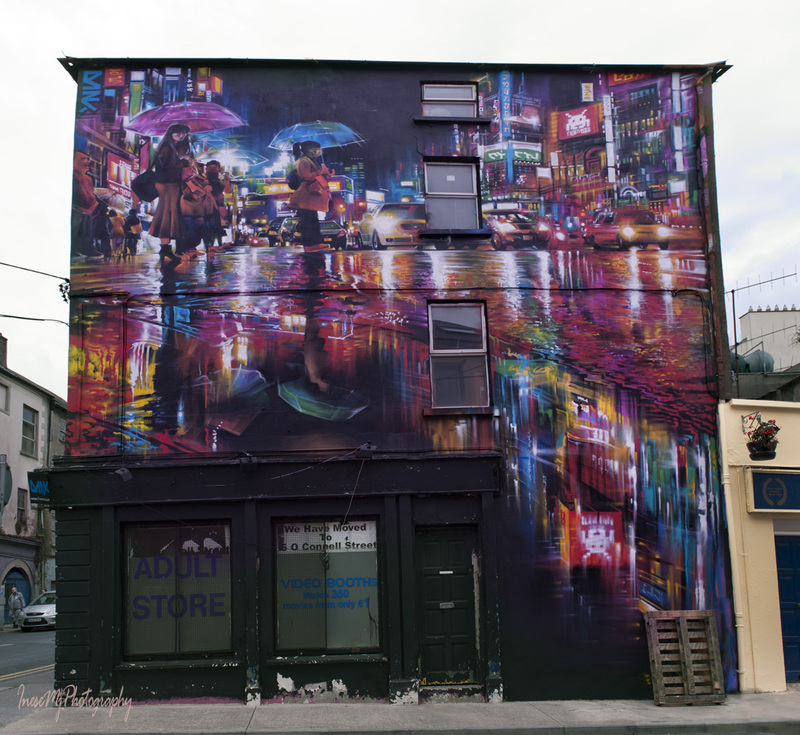 The Neon Waves mural by Dan Kitchener, aka DANK, is also painted over the last year’s work by DMC. It looks amazing. People still stop and stare at the neon beauty – rainy Shinjuku, Tokyo. 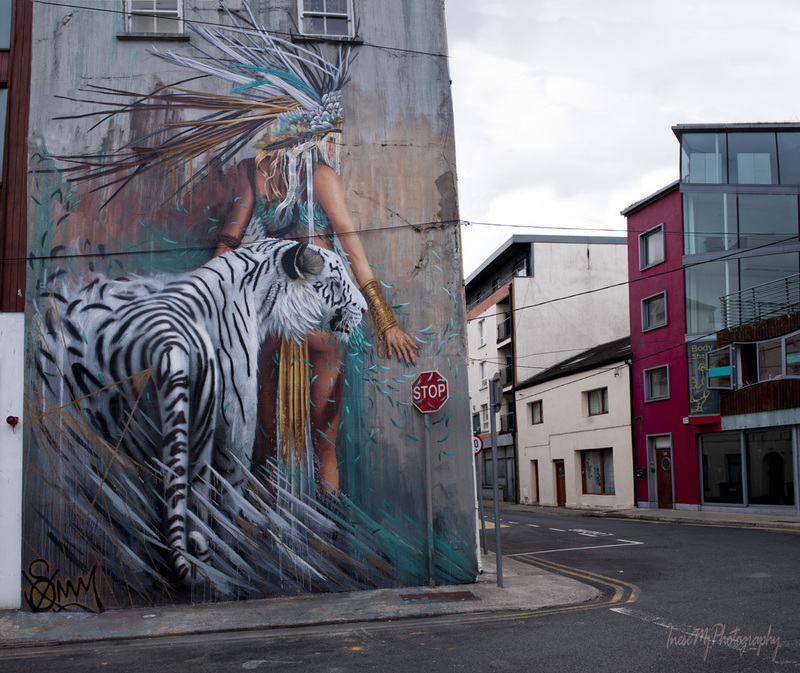 Another stunner is Eira and the White Tiger by Sonny, British-born artist from South Africa. We already have his Neon Tiger painted last year. The Stop sign is real! A few more works in my reach. Spaceship by Shane Sutton Art. 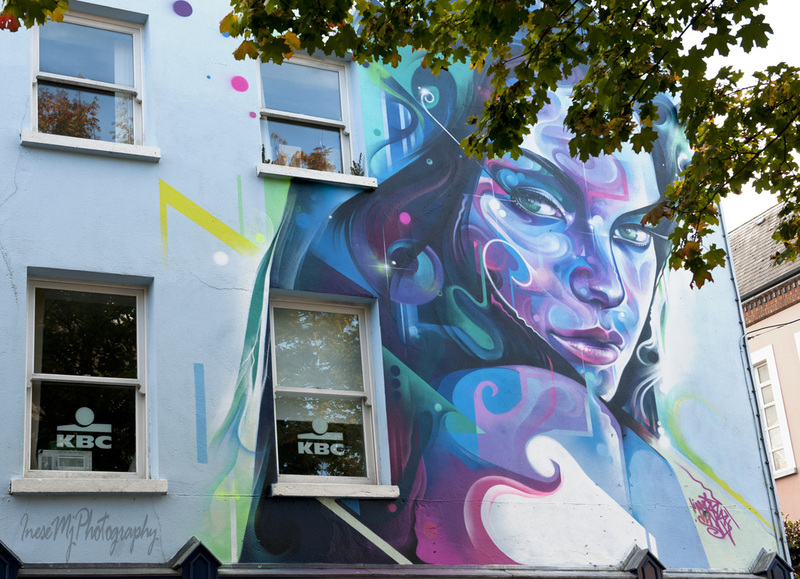 Mr Cenz, based in London. 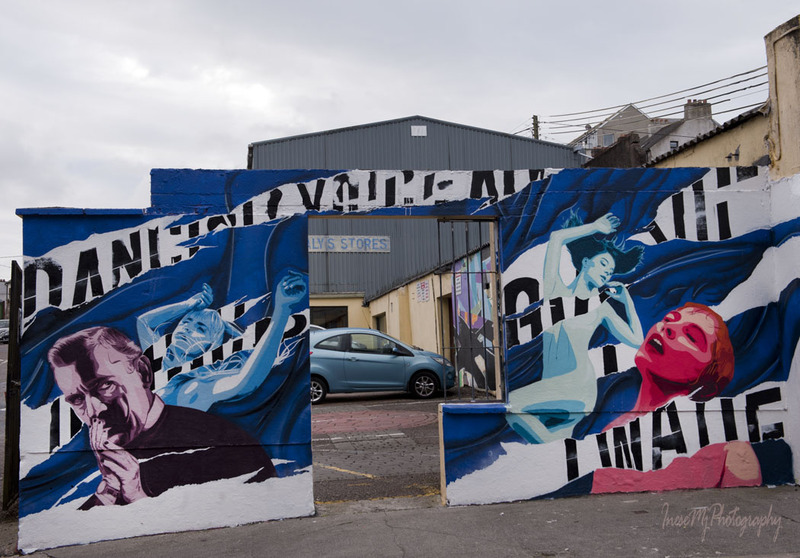 New at Waterford Walls. 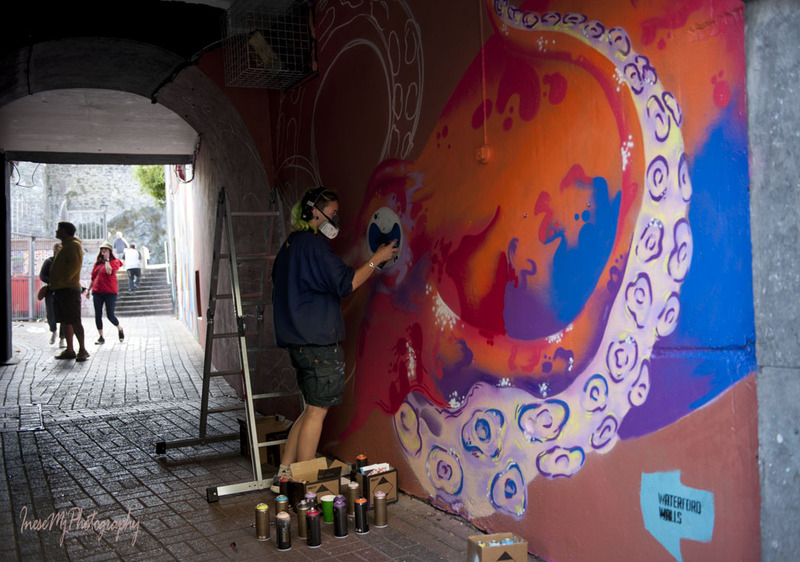 Our tour ends at the Waterford Walls HQ where UK based artist Peachzz is trying to set up an Octopus Lair. The other end of the lair. Looks fascinating. The HQ building and the wall by Curtis Hylton. 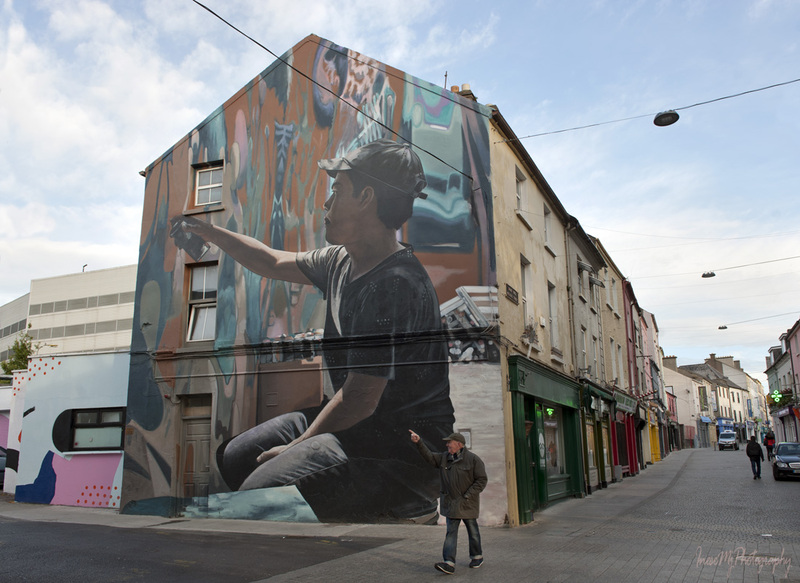 Thank you for visiting Waterford Walls festival! Fabulous photos Inese. I must show them to my youngest daughter, she’s just started art college in Limerick, she’ll love them. Thanks for such an interesting post. Thank you Jean! I think I wrote the street names somewhere in the comments. Your daughter can walk around when she has a chance and see some walls from the previous years too. It is so wonderful she started studying art in Limerick. Well done, and best of luck for the future! Arte, arte nas ruas, arte nos muros, arte na vida é o melhor remédio contra a escuridão. What a marvelous undertaking by so many artists. Not to mention your incredible photography. Thank you for sharing these. Than you so much for walking the streets of Waterford.